Social media isn’t just a way to promote your business. It also provides an avenue for interacting directly with customers and addressing customer questions and complaints. Sites like Twitter, Facebook, Instagram, and many others have changed the face of both marketing and customer service. But customers now expect different things from businesses today, and social media demands accountability from brands. Sprout Social recently conducted a survey exploring this new customer service world. Here are some of the top insights from that study. 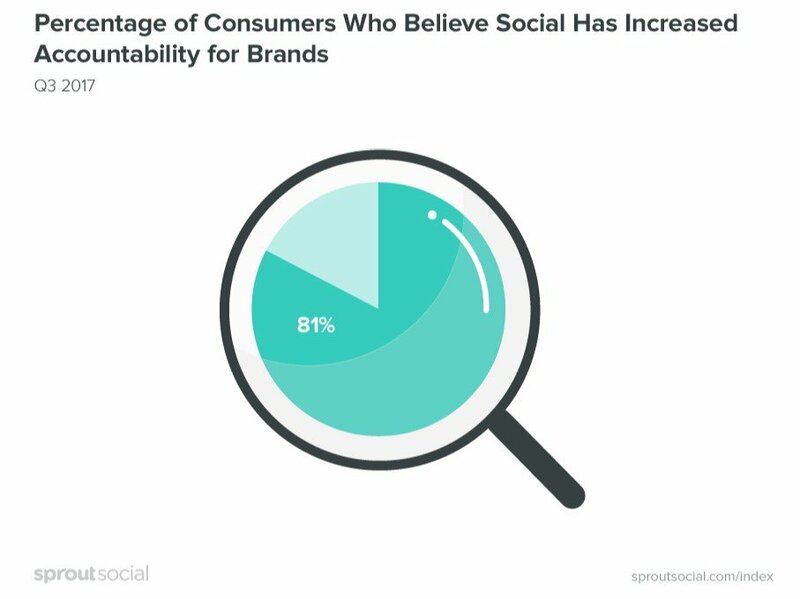 According to Sprout’s survey, most consumers believe social media increases accountability for companies. In the past, a customer complaint would only reach the people that customer told directly—likely just their close friends. Today, complaints are handled in the public sphere of social media, making responses all the more important. It’s crucial that brands deal with customer concerns professionally and quickly. To make sure you don’t miss any mentions of your company, have someone monitoring your social media as constantly as possible. In addition to comments on your page and posts that tag your account, you also need to check for posts that mention your brand or product but don’t tag you. You can search sites manually or use a customer-relationship management system to automate and organize your social media mentions, both tagged and untagged. It’s okay to get more information from a customer or solve their issue through a private message. Just make sure you publicly respond with an assurance that you will reach out privately to solve the problem. Otherwise, it will look like you ignored them. 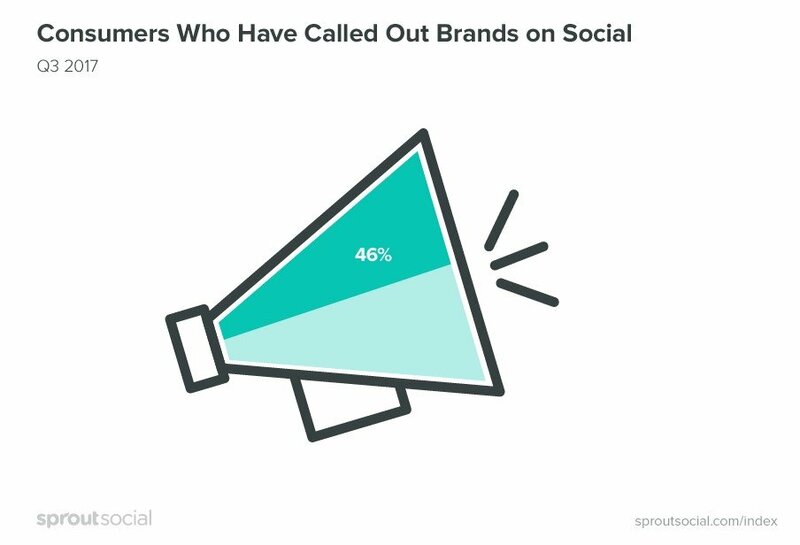 You might be surprised to learn that almost half of all consumers have used social media to publicly call out a brand. Millennials are even more likely to do so than other generations. 56 percent of them have called out a brand on social. Among other generations, the number is 44 percent. 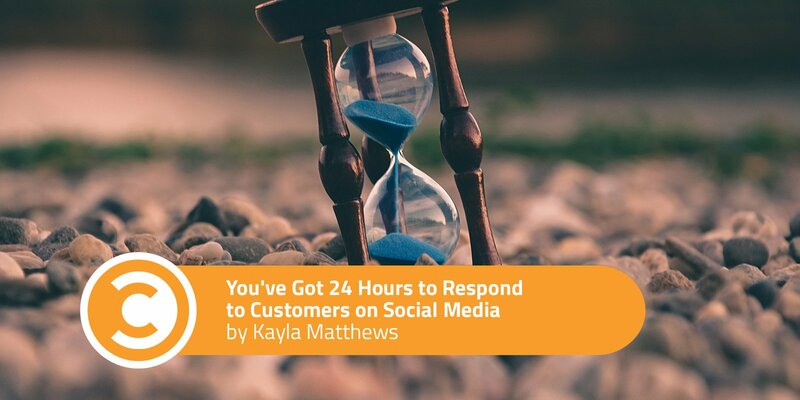 Clearly, companies can’t afford to ignore the customer service side of social media. A lot of customers use it to call out brands, and since this is more prevalent among younger people, the trend is likely to become more common in the future. The way you react to getting called out online plays a large role in determining how the situation turns out for you. Companies, especially those with a lot of millennial customers, should have a plan in place for responding to call-outs. These procedures should involve acknowledging the situation, admitting your mistake, and doing everything you can to fix it. Make sure that employees know not to ignore or delete negative comments. 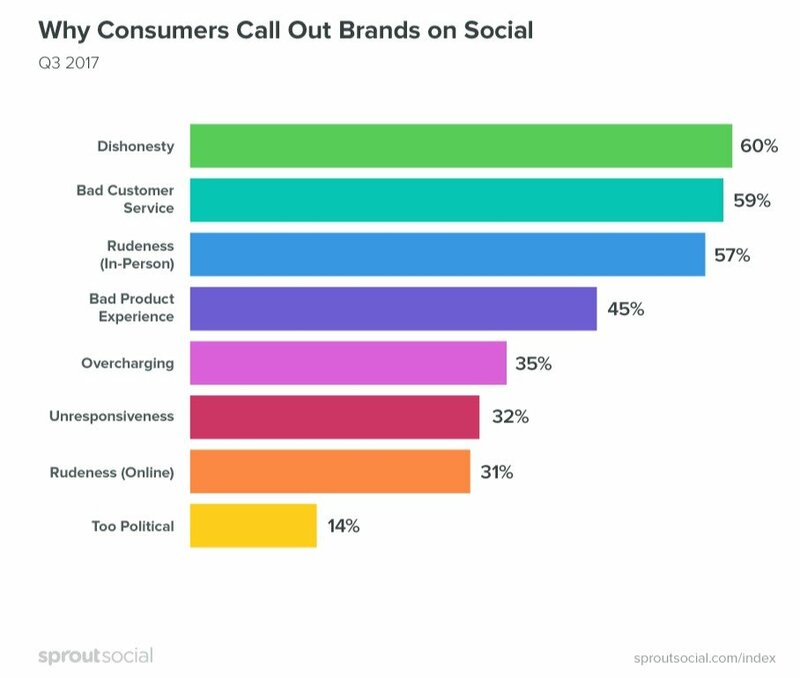 So why do customers call out brands on social? 60 percent said that dishonesty inspired their call-out. Bad customer service followed closely with 59 percent. 57 percent of consumers cited rudeness, and 45 percent said a bad product experience would cause them to ring the alarm bells. 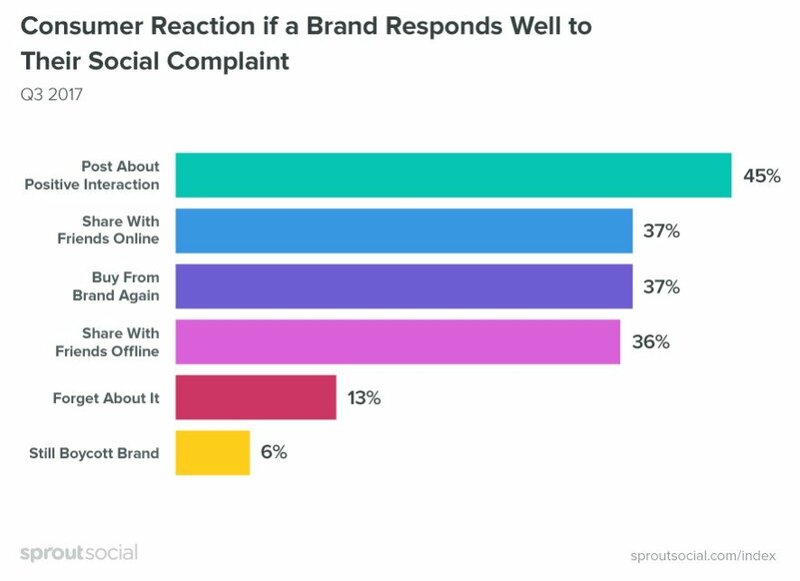 According to these stats, bad service is more likely to inspire a social media complaint than a bad product. While product quality is important, of course, businesses also need to focus on service. Naturally, they also need to be honest. When responding to any reasonable complaint, you should always apologize, especially if the problem was dishonesty. Make sure the internet knows that someone who can fix the relevant issue is aware of it, preferably upper management. If inadequate customer service was the problem, make sure the quality of your response is especially high to show you’re improving your service. You might even offer the customer something for free to make up for the mistake. What is it customers hope to gain by calling out a company online? The reason is rather unselfish and has to do with the social nature of these platforms. The top reason is to raise awareness of the issue among other consumers, according to 70 percent of survey participants. 55 percent want an apology or a solution. Customers know the power of the social and public nature of these platforms, and they will use it to their advantage. Because raising awareness is so important to consumers, brands also need to raise awareness of the fact they’re fixing any problems that arise by responding to complaints publicly. Brands should respond publicly to every complaint—and every positive comment too, if possible. If necessary, you could even post a separate status detailing how you’re improving your operations or counteracting issues that consumers might run into. Complaints aren’t the only thing that customers use social sites for. They’ll also post about it if a brand does something they like. If they post a complaint and a brand responds well to it, 45 percent of them will post about that positive experience on social media. 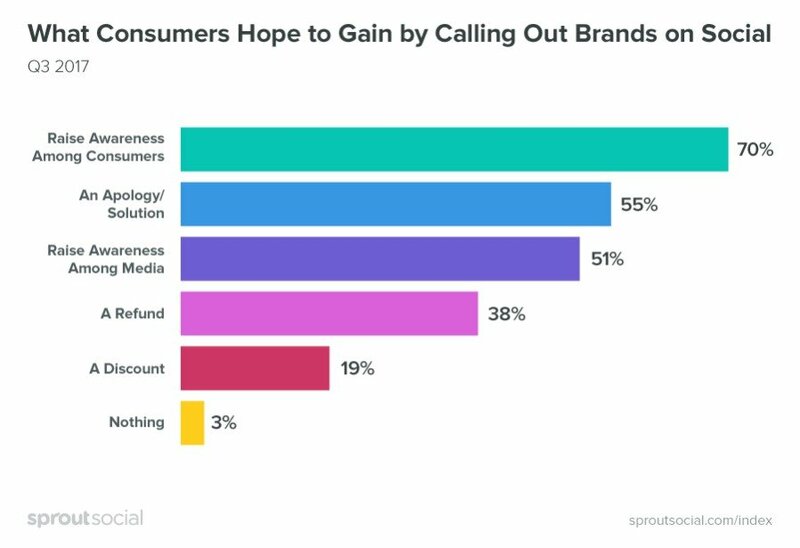 37 percent will share it with friends elsewhere online, 37 percent will buy from that brand again, and 36 percent will share it with their friends offline. This underscores the impact that your response to a customer complaint will have. Once you’ve resolved a complaint, comment again to thank the customer, and let them know you’re available if they have any additional questions in the future. To really go the extra mile, follow up sometime down the road. That will show that you’re really committed to quality customer service. While getting a complaint might be bad for your image, responding to it well can actually improve your image—especially if you and your customers post about your brilliant and helpful response.